Tag line: "Above All Things This Story Is About Love"
Moulin Rouge is a gem, the film that breathed new life into the musical genre. Loosely based on the tragic novel of the same name, Moulin Rouge takes us to Paris at the start of the 20th century. Christian (Ewan McGregor), who believes very strongly in "truth, beauty, freedom, and, above all, love", has just arrived from London to take part in the so-called "Bohemian Revolution". To this end. he rents an apartment across the street from the world-famous Moulin Rouge, a windmill-shaped nightclub run by Harold Zidler (Jim Broadbent) that serves as the spiritual center for the entire Bohemian movement. 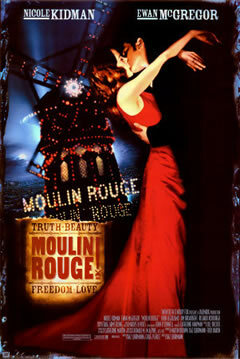 The star of the Moulin Rouge is Satine (Nicole Kidman), a courtesan who yearns to be a serious actress. Before long, Christian joins with the Bohemians, falls in love with Satine, and runs afoul of a nasty English Duke (Richard Roxburgh) who also has his eye on the beautiful showgirl. In fact, the Duke’s desire to possess Satine is so overwhelming that, in exchange for agreeing to finance the Moulin Rouge's transformation into a legitimate theater, he ‘purchases’ her from Zidler. Satine understands what the Duke’s money means not only to the Moulin Rouge, but her dreams of becoming an actress, yet she's deeply in love with Christian. Will the Bohemian ideals of truth, beauty, freedom and love win out in the end? In an interesting twist, Moulin Rouge relies on contemporary rock music (such as DeBarge's “Rhythm of the Night” and Elton John’s “Your Song”) to tell its century-old story of love. Director Baz Luhrmann’s plan in incorporating these hits of today into the setting of the early 20th century was, as he puts it, to “de-code” the excitement contemporary visitors to the Moulin Rouge would have experienced. It was his belief that, had he instead fallen back on music from that time period, it would've left modern audiences uninspired. With its ingenious ‘re-realization’ of recent hits, Moulin Rouge instantly draws us into the exhilaration of it all, and the world-famous nightclub is alive once again. Of the many musical numbers performed throughout the film, my favorite is the highly-charged, ultra-romantic medley that takes place high atop the Moulin Rouge's Elephant Room (thus named because...well...it's shaped like an elephant), where Christian attempts to woo Satine by belting out a mixture of instantly recognizable tunes, including “Up Where We Belong” and “Heroes”. In fact, ‘highly charged’ is the perfect description for this entire film. If there’s one thing Moulin Rouge has in abundance, its energy, making great use of a quick-cut editing style that keeps events flowing along at a frantic pace. In the wrong hands, such an approach could be confusing, even distracting. Not here, though; the opening number at the Moulin Rouge, complete with chorus girls dancing the Cancan and patrons in tuxedos performing a rendition of Nirvana's “Smells Like Teen Spirit”, boasts such an exciting rhythm that it drives the sequence forward, as opposed to confusing it. This, in combination with the energetic soundtrack and marvelous performances, works towards making the entire Moulin Rouge experience a delightfully overpowering one. I've got to see this one again. When I saw it the first time, everybody I knew had raved about it to me, and I thought, "Hey, it ain't THAT good!" I did like the idea, and the loony enthusiasm of it, but it didn't quite come together for me. I did think Nicole Kidman was mis-cast. She's a really good actress, but I didn't buy her as a performer that men would go crazy for (let alone the fact that that she looked far too sturdy and healthy to be dying of whatever she was supposed to be dying from). But I should give it another chance. One of the few films i've paid to see more than once during its original theatrical release. I don't think there is a more energetic musical. Anthony: Definitely watch it again. Kidman is fine as Satine, one of her better performances, I felt (admittedly, I too had a hard time accepting her as a prostitute at first, but that dissipated as the film progressed). Klaus: Absolutely! The energy in this film was addictive, and I only wish I got the chance to see it on the big screen. @flixchatter: Excellent choice! I'm a fan of this film's soundtrack as well, one of the few instances I don't mind listening to someone else's take on classic songs. Thanks for stopping by, and for the comment! It's appreciated.